An unusual type of ballerina is coming to New York City’s Lincoln Center for the Performing Arts. 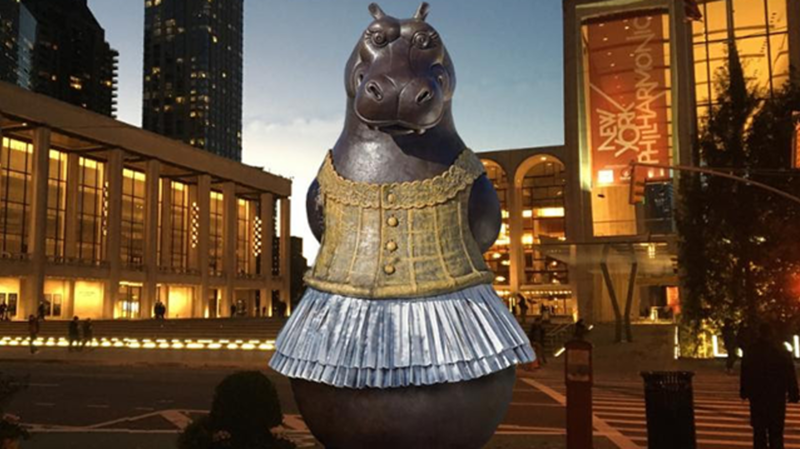 Hippo Ballerina, a sculpture by Danish artist Bjørn Okholm Skaarup, is going to be placed across the street from the famous performance space this winter thanks to the city’s Art in the Parks program. Adorned in a copper tutu and weighing over 2.5 tons, the mammalian sculpture is more than 15 feet tall, and will stand in Dante Park at the corner of Broadway and 64th Street. The bronze hippo has a somewhat menacing air about her, perhaps to better fit in with New York’s other animal sculptures, like the famous Wall Street bull or the lions outside the New York Public Library. The piece’s design inspiration was a mash up of the Degas sculpture Little Dancer Aged Fourteen and the dancing hippopotami of Disney’s Fantasia. She’ll be on view until the end of July 2017.